Do you know about Macy's Beauty Box subscription? I actually didn't know about it until recently, and decided to try it out starting with the April box, which focused on natural/earthy products, which was a perfect fit for Earth Month. 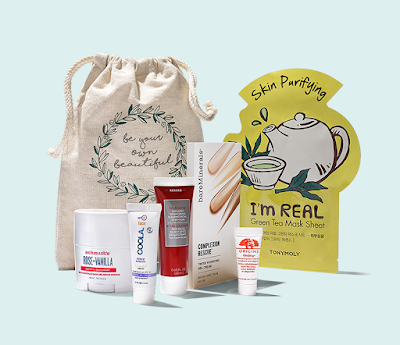 Macy's Beauty Box launched last fall for $15 per month, and comes with five deluxe beauty samples, one bonus item, $5 off your next beauty purchase and a collectible cosmetic bag designed exclusively for Macy's Beauty Box subscribers. Each month's Beauty Box is a surprise, with each deluxe sample specially chosen by Macy's beauty experts. I've actually used the Origins GinZing™ Refreshing eye cream before, so this sample size version is perfect to travel with. My face gets more oily in the summer, so I'm happy that the Coola Mineral SPF 30 has a matte finish. I have a sensitivity to deodorants so I'm glad Schmidt's has plant & mineral-derived ingredients instead of aluminum. I like the deodorant itself, I'm just not crazy about the Rose +Vanilla scent since I'm really not into floral scents. I would love to try the Bergamot + Lime and Lavender + Sage scents. That being said, I'm not a fan of the Korres Wild Rose scent but I do like the sleeping facial itself - it makes my skin feel smooth and soft. The Tony Moly green tea mask is for brightening skin tone, and works great. I am always up for trying out new sheet masks, since I like to use them 2-3 times per week at night before I go to bed. The bareMinerals Complexion Rescue sample pods included four shades. The natural shade works for my skin tone yet the tan shade will match as I get more sun throughout the summer. I think my perfect shade would be in between both the natural and tan shades, which they do make, but isn't included with the sample pods. I do like that it has SPF 30 built in and has a lightweight, sheer-to-medium coverage. Overall I was happy with the items in my April box. I'm glad there were different types of skincare items, and I love the brands that were featured. The pouch or cosmetic bag in each monthly box is definitely a plus. With subscription boxes, I feel like you aren't going to like everything you get but it's worth it to find those products that you really do love. Plus I love sharing any products that won't work for me with friends and family. Thank you Macy's for giving me the chance to try this out! To sign up for Macy's Beauty Box, go to https://www.macys.com/subscription/beauty-box. You can also see what was included in some of the previous boxes. Here's a look at the May 2018 The Bronzed Look box, from highlighters to bronzers for a sun-kissed glow. Can't wait to see what is in the June box!